Our menu is full of fabulous homemade food, freshly prepared to order using quality local produce. We serve breakfast and lunch every day of the week along with speciality teas and coffee, indulgent cake and homemade scones (freshly baked each morning!). There is a daily Specials Board and Gluten Free options. You can check out our main menu here. Situated within the World Heritage Site of Hadrian’s Wall and next door to the 12th century Lanercost Priory we are truly blessed with a fabulous setting making us the perfect place to meet and eat all year round! When the weather is kind you can enjoy sitting outside on the terrace –‘café culture Cumbrian style’. 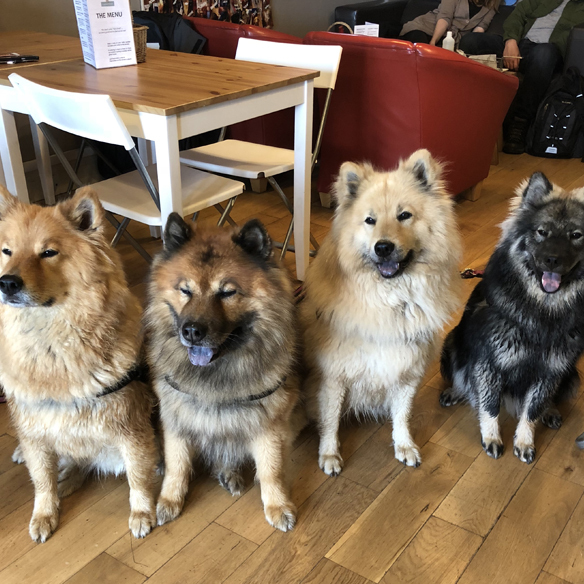 Check out our Bark & Brew, our dedicated dog friendly seating area for your canine companions too. You will find us open every day including Sundays and Bank Holidays. Situated 12 miles east of Carlisle, 15 minutes from the M6 and easy to find at the gateway to Hadrian’s Wall. Simply follow signs from the A689/A69 to Brampton and then the Brown Tourist Signs to Lanercost Priory and Birdoswald Roman Fort. This will take you straight to us. We like to think we’re a bit of a hidden gem tucked away in the Cumbrian countryside. 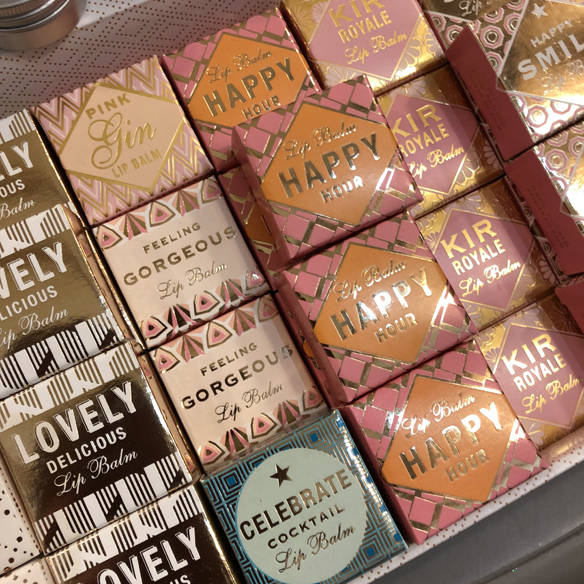 Our gift shop is packed full of unique products from candles, lip balms and soaps to pure wool throws, scarfs, handbags and decorative accessories. And when you shop with us you support other small and local businesses as many of our products are ‘Made in Cumbria’ or ‘Made in Britain’. All dogs and their well-behaved owners welcome. 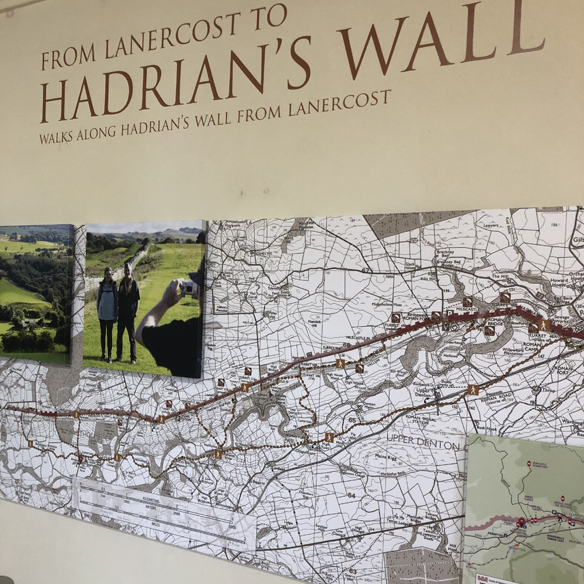 Our Hadrian’s Wall Visitor Information Centre is the ideal starting point for your journey along Hadrian’s Wall, World Heritage Site. Read the interpretation panels which tell the story of the area and are full of ideas of places you can visit with travel times and SAT NAV references for your convenience. You can also pick up your free Hadrian’s Wall map whilst you’re here that will help you along your journey. Discover the Roman and Medieval stories in every direction with information to help you explore Hadrian’s Wall and the history and landscape that surrounds it. © 2017 Website Design by ioomi. All rights reserved.